Consider that for the past 40 years, a staggering 56 million Americans have been killed by abortion. It claims the lives of over 1.2 million children every year, or roughly one child every 25 seconds. So why isn't the American church doing more to stop this atrocity, which is the greatest holocaust in American history? “If	you	are	slack	in	the	day	of	distress, your strength	is limited. Deliver those who are	being	taken	away	to	death,	and	those	who	are	staggering	to	slaughter,	Oh	hold	them	back! The majority of American churches, God’s institutions for spreading the gospel of peace and defending the weak and innocent, remain silent. Feeding the poor, stopping human trafficking, rescuing children from abuse, and protecting women from exploitation are all issues the church is addressing. Yet abortion remains eerily absent from the list of church priorities in America. Why is abortion not the church's highest priority? Is the American church silent because abortion has become politicized and church leaders are afraid to discuss it or because we simply don’t know what the Bible says about it? What will cause the church to wake up, rise up and take this issue to task to save our children? In his latest book, Deliver Us From Abortion: Awakening the Church to End the Killing of America’s Children, Brian Fisher, co-founder and President of Online for Life, breaks the veil of silence and uncovers the reality of abortion in the church, what the Bible really says about it, and how God has empowered His church to end this unspeakable tragedy. Page 1. Contents: chapter breakdown and titles. Page 2. A personal note from the author. Page 63. Chapter 5: Does god Give Man the Right to Kill Innocent Life? Brian Fisher’s book Deliver Us From Abortion challenges the church to end abortion in America. This book provides a powerful defense for the children who can’t speak for themselves. Abortion is the greatest moral crisis of our generation, yet far too many churches have remained silent. In Deliver Us From Abortion, Brian Fisher offers a blueprint for the American church that is both instructive and encouraging. I pray that we can all hear and accept his challenge. Growing up in the King family during the Civil Rights era, I know what the church can accomplish. I am so glad Brian has written this book. May it challenge and equip the church to end the abortion holocaust in America. Could it be possible that we could actually be within reach of reversing the greatest evil of our generation? Many think so, myself included, and Brian Fisher lays out the landscape in this very important book. And he’s right: it will only happen when the church addresses abortion with all the fervor, clarity, love, and compassion it can muster by God’s grace and power. 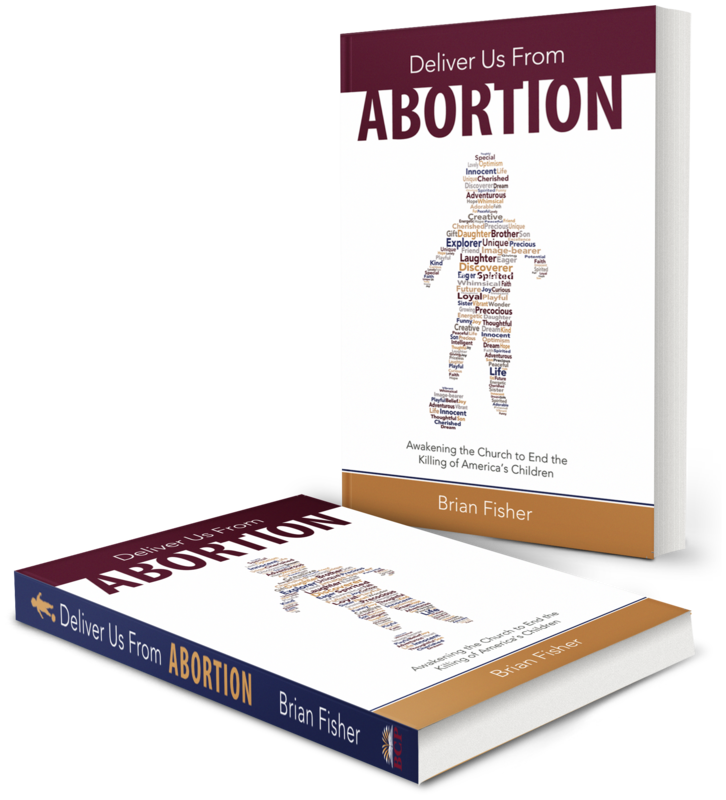 Author, speaker and business executive Brian Fisher has a passion for saving unborn children and their families from abortion. But he took an unlikely path to his position as Co-Founder and President of Online for Life. He started a small, volunteer non-profit on the side in 2009, Online for Life, to start realizing the dream of using compassion, truth and business applications to rescue babies. A few months later, when the ministry cooperatively saved its first baby from abortion, he said he felt “unbelievable joy.” While running Online for Life as a volunteer, he moved over to Pursuant as Executive Vice President of Operations after it acquired KMA in 2010. In early 2012, he left the for-profit world to become President of the rapidly expanding Online for Life.